The chapter was organized in April 1966. 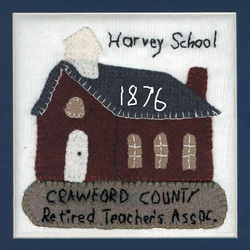 Membership was open to all retired teachers and administrators in Crawford County. The purpose for the chapter was to aid in the advancement of public instruction, to foster good fellowship among retired teachers and to promote the interests and welfare of the retired teachers of Ohio. The first constitution was drafted by Dr. E. Dietrich and D. C. Baer. It has been revised several times with the last revision done in 2005. The first dues were set at $1.00 per year and have been increased to the current annual dues of $5.00. The chapter has been recognized by the Ohio Retired Teachers Association as an Honor Chapter. Officers are elected at the fall meeting for a two-year term that starts the beginning of the following year. Standing committees have changed over the years but now include Community Service, Informative and Protective, Legislative, Membership, Public Relations and Retirement Planning.The first luncheon meeting was held on September 19, 1966 at Morton's Motel and Restaurant. (The current meetings are held in four churches in the towns of Bucyrus and Galion.) Matters of concern for the new chapter were state and national control of education, pensions, enrollment of new members, health care, Medicare, new members, luncheon reservations made but not paid for, more new members, length of meetings, legislative issues, volunteering and community involvement and, yes, more new members. During the last few years there was a concern about the composition of the State Teachers Retirement Board and the combination of one faction. Changes have taken place to produce a more balanced STRS Board. A Community project of our Crawford County chapter has been the renovation of a one-room school house. This project in nearing completion and Harvey School will soon be open for classes conducted the "old-fashioned way" with volunteers from our chapter. It has been quite a project with several community organizations involved along with our chapter. One of our members, Richard Stearns, was elected to serve on the Ohio Retired Teachers Association Board in 1999 as District V Director. He then served as Vice-president for the western side of the state, President-Elect and state President of ORTA. Richard is currently a member and past president of ORTA and also our local chapter.